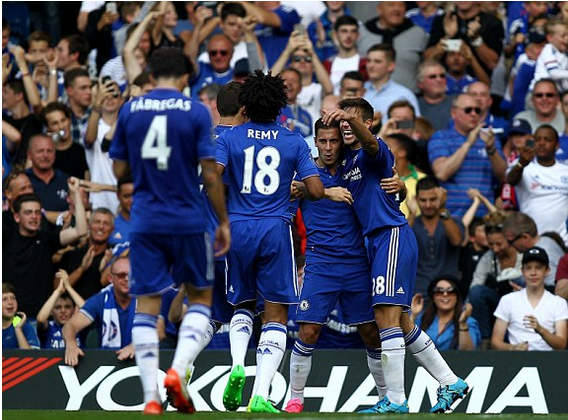 Chelsea 2-0 Arsenal: Forget Costa - Arsene Wenger got it wrong and Jose spot on! The Diego Costa/Gabriel fight has made most of the headlines in the aftermath of this one but if we stop and think about the ACTUAL game for a second, Arsene Wenger got his tactics totally wrong whereas Jose Mourinho got his spot on and that won the game for Chelsea! Heading into the game I was slightly apprehensive due to our recent league form (OK we beat Maccabi Tel Aviv but seriously, there are nowhere near the same quality of the Premier League and Arsenal in particular). Despite Arsenal's midweek defeat in the Champions League, I knew they had players who could really hurt Chelsea and Branislav Ivanovic in particular if he was selected. I was up at Earls Court early promoting Burger King UK's #PeaceOneGame initiative ahead of #WorldPeaceDay and was to handout a free Burger King Whopper to an Arsenal fan to show that any rivalry could be put to one side. If anything, I'm glad it was pre-game and not afterwards as I don't think the slogan or the idea would have worked! I was with Hayley @TeaPartyBeauty (Fashion Blogger) and Alex @aldo_doel who writes for the popular Anti-Arsene Wenger blog Le Grove to attend the VIP section of the ground after photos and videos were taken. After our job was done, we went to the ground and this is where Alex pointed out some interesting thoughts on Wenger with one of them being his lack of training based around tactics ahead of games and the fact that he will never substitute Santi Cazorla. I admitted to both that I thought it would be a draw and I would have settled for that based on current League form. When I saw the teams announced including Branislav Ivanovic named at right back, my worst fears had been realised - I never should have worried. I pointed out to both that Ivanovic was our weak link in defence with Cahill playing next to Kurt Zouma (with both outstanding) and Cesar Azpilicueta moved back to left back. I had stated that every team we had faced this season had targeted him down our right and had got their rewards from doing so. Up against Alexis Sanchez, I genuinely feared the worst. I could not understand the Arsenal team selection with Oxlade Chamberlain and Olivier Giroud on the bench? Theo Walcott started up front being supported by Sanchez left, Ozil at number ten and AARON RAMSEY on the right? Ramsey on the right? What? It played right into our hands. With the 4-2-3-1 formation, there are times in games that you need your striker to hold the ball up and bring others into the game. Although they started well, Arsenal never really had that option and wave after wave of their attacks would reach our final third and break down. Azpilicueta had Ramsey in his pocket, Ozil as usual did and produced nothing in the big game and Alexis Sanchez fleeted in and out of the game with noticeably all three of them looking to come inside all the time which was food and drink to our full backs. 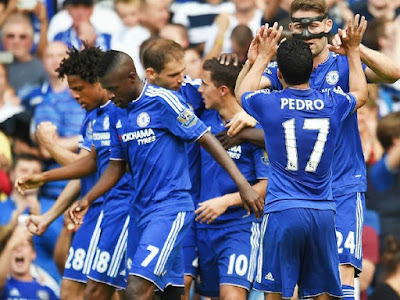 With Oscar selected as our number ten being supported by Matic and Fabregas behind, Hazard down the left and Pedro down the right hand side, all supporting Diego Costa, Chelsea looked to have a better tactical balance than Arsenal and it proved to be the case. All of those players mentioned worked their socks off for the cause whereas you would be hard pushed to name three, four or even five of Arsenal's to have done the same to influence the game. 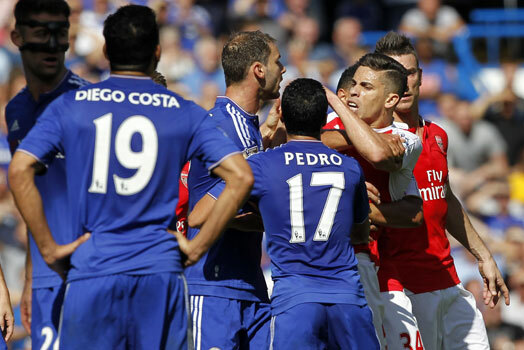 The turning point was Diego Costa's clash with Gabriel which started with Koscielny. It was all pretty much handbags until, with a Beckham on Simeone kick in a moment of madness, Gabriel was sent off for reacting to a constant volley in his ear of abuse from the Chelsea striker. 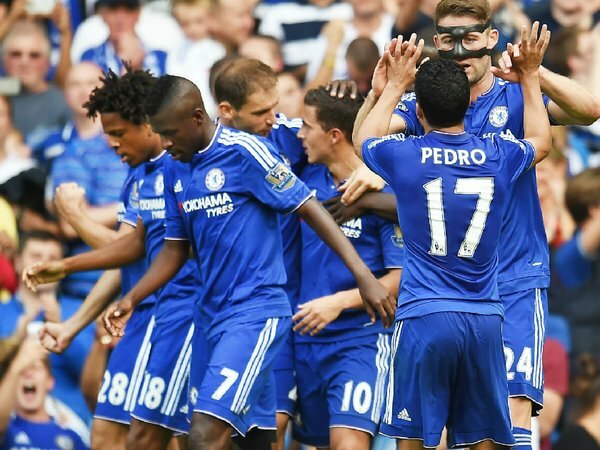 You know what to expect from Costa so you need to be aware and prepare for it. 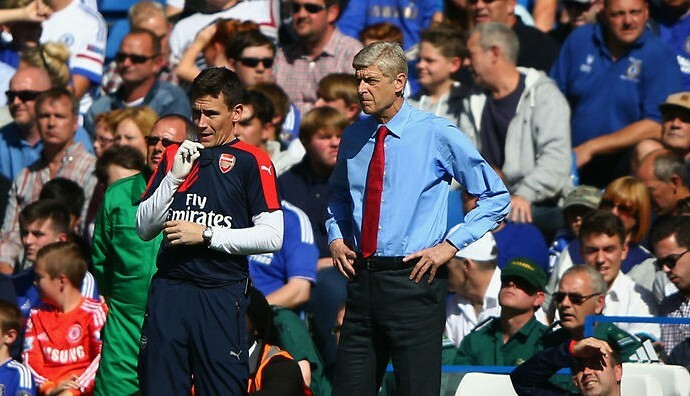 Arsenal never did and Gabriel in particular played right into the hands of Costa and it cost him and Wenger the game. 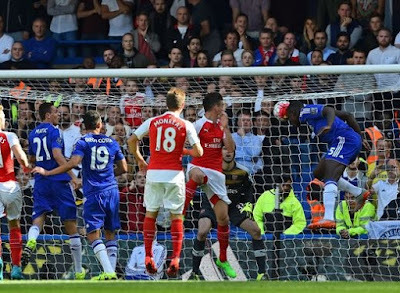 Our goals were good again with Cesc notching his second assist in the space of three days with his cross to the far post from a free kick for Kurt Zouma to rise unmarked to head down to the near post with the ball creeping past Petr Cech who was stuck to his goal line making it 1-0 Chelsea. Arsenal to their credit tried to keep playing football but again it was the same old story. They would either look to come inside to a crowded midfield or get in and around our box to then make the wrong selection and their attack faded. The Arsenal plight was further hampered when Santi Cazorla, who had already been booked, brought down Cesc Fabregas who had won a 50-50 ball. Mike Dean the Referee had no hesitation in holding up a second yellow card followed by a red to leave Arsenal with nine men on the pitch. 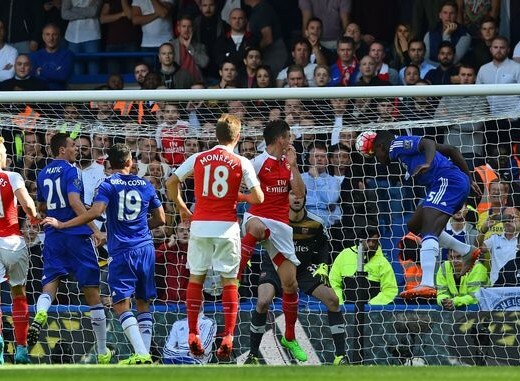 Chelsea from that moment then began to manage the game well and holding onto possession as Arsenal looked to play a counter attacking game. The late introduction of Oxlade-Chamberlain and Giroud was far too late. Chelsea wrapped things up late in the game as Eden Hazard with the aid of a deflection, drove the ball into the net giving Petr Cech no chance on his first return to Stamford Bridge after his summer move across London. Overall Jose got his tactics and team selection spot on and to a man, everyone delivered a hard-working committed performance. Arsene Wenger got it wrong and didn't react quick enough with his substitutions. Arsenal never set their stall out to attack Ivanovic like everyone else has done and it caused them a problem. I understand that people have and will remain focused on Costa after his antics but when people actually take time to consider the football match that took place they will see that Chelsea and our manager deserved to win the game. It was a massive three points!